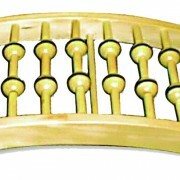 Relieve nagging back pain with the magnetic Backstretcher. Magnetic therapy inserts. Scientifically designed to relieve back pain and injuries. Designed by a chiropractor, this scientifically shaped curved frame supports, stretches and massages the lower back, and spine, helping reduce pressure on each vertebrae to gently realign them to a more natural stress-free position. The rolling balls provide gentle but deep Shiatsu-style kneading, helping to increase blood flow, relieve muscle tension and bring soothing relaxation to your back. In only 15 minutes your backache should have melted away. Crafted in quality hardwood. Measures 76cm x 25cm x 9cm. Guaranteed for 5 years. This device is intended principally for lower back pain.